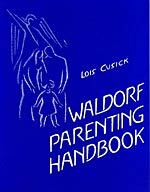 This is a classic, deservedly beloved handbook for any parent wanting a helping hand in understanding how to bring the Waldorf approach into their homes and hearts. Originally published in 1979, the present 3rd edition (1992) brings Cusick’s work up-to-date without sacrificing its heartwarming good advice or compromising her straightforward answers to important questions. The Waldof Parenting Handbook is like having a wise grandmother to help you nourish your children as the travel through their school years — it’s really a pleasure to offer this book! The Waldorf Parenting Book is such a treat. There are many books that offer an overview of Waldorf education, but this one goes a step further, and actually demonstrates how the theory works in practicality, and what it looks like in the classroom. The subject is given great attention into adolescence, but the information will help the reader the most when investigating Waldorf education through 8th grade, as high school education seems to shift as children move into their third phase of life, but the subject is still addressed in a chapter all its own. The book opens with the first three years, and with a chapter on the temperaments, but my absolute favorite section (that is literally glowing from the amount of orange highlighting and writing in my copy) is the chapter Fantasy and Fact in Early Childhood. I loved Cusick’s depiction of the importance of fantasy and fairy tales in developing our children’s psyche and sense of safety. As a librarian, I often come across parents who are concerned with their children reading fantasy materials, particularly the “original” versions of the stories (and there are many versions). The evidence is in: librarians and Waldorf educators agree that fantasy is a healthy developmental tool for children, in finding morality, feeling out dangerous situations without too much personal investment (death of a parent, etc. ), and the fact that children do not want, need, and are indeed, incapable of processing technical information when a fantasy story would tell the “truth” much better. For this chapter alone, I would recommend this book to anyone.